One of Europe’s most high profile golf resorts, Les Bordes is a luxury retreat built on a secluded hunting estate deep in the Loire Valley’s ancient Sologne forest. It was originally conceived by Baron Marcel Bich, the Bic pen pioneer, and Mr Yoshiaki Sakurai, as a private international golf club for friends and colleagues that was to house France’s best kept and most challenging layout. After considering a number of prominent course architects, the Baron selected American Robert von Hagge as his designer and invited him to Paris to discuss the project. Von Hagge traveled to France unaware of his client’s background or the scope of his ambitious plans and upon arrival was shown a rudimentary layout and master plan for the vast property. The designer then readied his Parker pen to make some alternate suggestions to the plans before him, and it was only after being politely asked by the Baron to use Bic pens when working on the project, that he realized who his client actually was. For von Hagge and his partner Rick Baril, Les Bordes was quite an undertaking as the property was flat and featureless, except for small stands of hardwood, and covered mostly in cornfields and marshes. It was originally conceived as a 36-hole project and construction started on holes that required no tree clearing as the necessary permits had not yet been secured. As the estate was former swampland with heavy clay soils, the playing areas had to be raised so a number of lakes were built on land already cleared of trees and the fill used to build up the fairways. The greatest compliment one can pay the design team is how natural the entire golf course feels, and in particular the wetland areas which come into play on at least a dozen holes and blend beautifully with the forest and its accompanying undergrowth and look to be part of the ancient landscape. Indeed Baron Bich was so enamored with the total tranquility of the first eighteen when it opened that he immediately shelved plans for the second course. Following his death in 1994, his dear friend Mr Sakurai became sole owner of Les Bordes and today runs the estate as an idyllic resort for a high-end golf market who demand and appreciate quality. 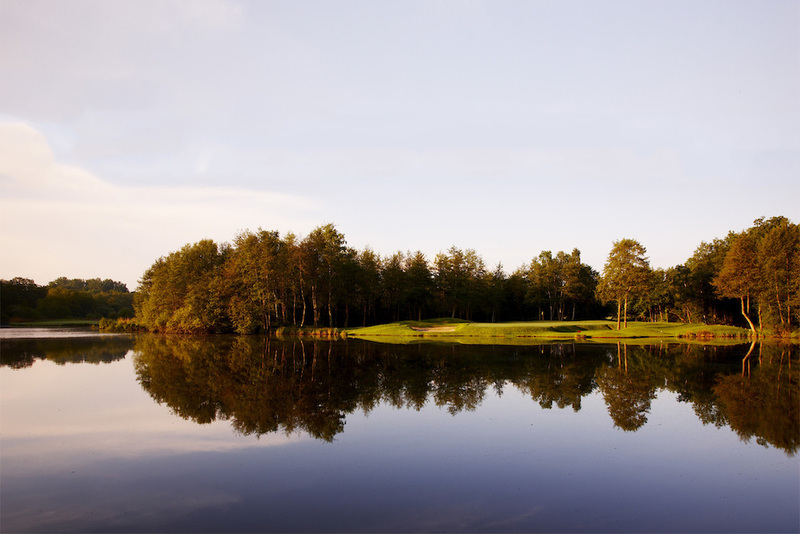 Similar in both concept and style to a club like Loch Lomond, Les Bordes is a typically extravagant resort style experience complete with immaculate playing surfaces, punishing penal design, isolated target areas, heroic carries and severely contoured putting greens. While some of the design decisions are questionable, such as building a par five around wetlands but cutting off its fairway to force a lay-up from the tee, the holes are nonetheless attractive, well constructed and very enjoyable to play. The early holes give you a pretty clear indication of what lies ahead here, an opening island green ringed by a massive sandy waste bunker is followed by two narrow long holes and the first of the eye-catching par threes, with its small target pressed up against a pond. More meritorious are subsequent moments like the approach into the 9th and the par four 6th, which is played along a deep bunker that contains a cross commemorating a fallen knight. The back nine has more water than the front and probably shades it a little in terms of excitement and good golf with better holes including the beautiful par three 13th and the two-shot 17th, which bends through the ancient birch forest. Also noteworthy, the typically bruising closing hole features a long all-carry approach across water and into a shallow green with a steep step. Les Bordes will not be to everyone’s taste but is the best and most significant European course out of the prolific office of golf course architect Robert von Hagge. Though the shaping in places is a little overdone, the course is beautifully built and the site so pretty that it is easy to see the attraction of Les Bordes and hard not to fall for its charms.